Our mimimum order is $400. Freight deliveries via Zoratto Enterprises nominated carrier. New accounts require three (3) trade references. All accounts are subject to final acceptance from ZORATTO ENTERPRISES. All invoices are subject to terms of 30 days net from date of statement to approve credit accounts, that is, all invoices must be paid in full by the close of the following trading month. Any account in arrears ninety (90) days will not be supplied until payment is made in full. Risk in the goods supplied shall pass to the customer immediately on the delivery to the customer, or into the custody of their agent. The title to such goods shall remain with Zoratto Enterprises until full payment has been received for the goods. All fees and expenses incurred by Zoratto Enterprises in collecting outstanding debts shall be payable by the customer. All orders will be accepted subject to prices prevailing on day of shipment and under terms stated above. All our prices are subject to change without notice. All prices are net trade and exclusive of Goods and Services Tax (GST). All claims for any cause including but not limited to damaged goods, shortages or errors must be filled within fourteen (14) days from receipt of goods. No claims for any such cause made outside these stated times will be recognised. All costs and expenses incurred in returning goods under this clause will be at the customer’s expense. All claims for refunds, exchanges or credits in relation to (but not limited to) damaged goods, product shortages or product errors in deliveries must be notified to Zoratto Enterprises in writing within fourteen (14) days from receipt of goods. No such claims notified to Zoratto Enterprises outside this timeframe will be recognised. 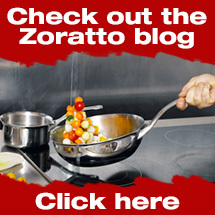 Product returns or exchanges a result of change of mind (or similar) for refund, exchange or credit are subject to the prior approval of Zoratto Enterprises (which may be given or withheld in its discretion) and only where the products are undamaged, of merchantable quality and of the current batch (where applicable). 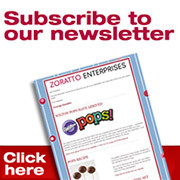 Zoratto Enterprises may impose (in its discretion) a handling and administration fee of $15.00 or greater (as required) for product returns or exchanges. All costs and expenses incurred in returning goods under this clause will be at the customer's expense. Copyright in the images and photographs contained on this website remains vested in owners of same, who have granted an exclusive right to Zoratto Enterprises to use and reproduce these images and photographs in Australia. The content of this website, including but not limited to the images and photographs described above, and any text, graphics or other content contained therein, may not be copied, saved, reproduced, manipulated, altered or used in any manner or form whatsoever without the prior written permission of Zoratto Enterprises.